Frugal & Fabulous: Dairy Pure Milk - Now With Easy Flip Cap! Dairy Pure Milk - Now With Easy Flip Cap! 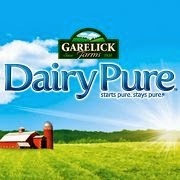 I've tried lots of milks - but one of my favorites is Garelick Dairy Pure! This milk is always fresh and tastes great! 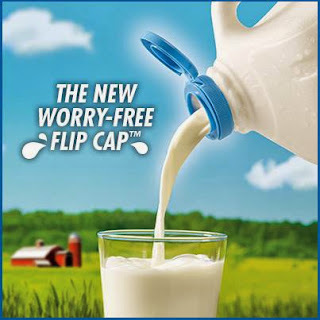 And now it comes with a worry-free flip cap - so it's easy to open and you'll never lose or drop it. I know it sounds like a simple concept - a milk cap, but having a flip cap makes it just a little bit easier when you're trying to get out of the house in the morning. Just flip, pour and go! One of the reasons I like Dairy Pure is that it is hormone free. They also have a five point purity checklist to make sure your milk is as fresh and tasty as possible! One of my favorite things to make with Dairy Pure is my husband's favorite Chocolate Pudding Pie. Preheat the oven to 375. Combine above ingredients and then press into a pie tin. Bake 8-10 minutes or until slightly browned. Prepare the pudding: Wisk together a 3.9 oz box of instant chocolate pudding with 1 3/4 cups of cold Dairy Pure Milk. Pour immediately into the cooked pie crust and refrigerate until firm. Top with whip cream and enjoy! Disclosure: This post is sponsored by Dairy Pure. All opinions are my own.